It’s easy to get excited about a newly-described fish species with dazzling colors, but we suspect some AMAZONAS readers believe they have more refined, sophisticated tastes, and are perhaps above simply lusting over the obvious. You probably realize that being big, bold, or colorful is not the only way a fish can earn our admiration. As I already stated, in honor of those die-hard ichthyologists who scour the planet in search of new life—even if it is drab brown—let us be the first to herald your accomplishments! Could we just encourage you, and the journals who publish your work, to also include photos of the live coloration (even if the fish looks more or less the same dead or alive)? Leptobotia bellacauda; China: Anhsui province, a-b SNHM 20160220, holotype, male, 70.1 mm SL; c-d, SNHM 20160221-20160224, paratypes, c, female, 64.6 mm SL, d, female, 76.7 mm SL. Photo credit: Bohlen et al. 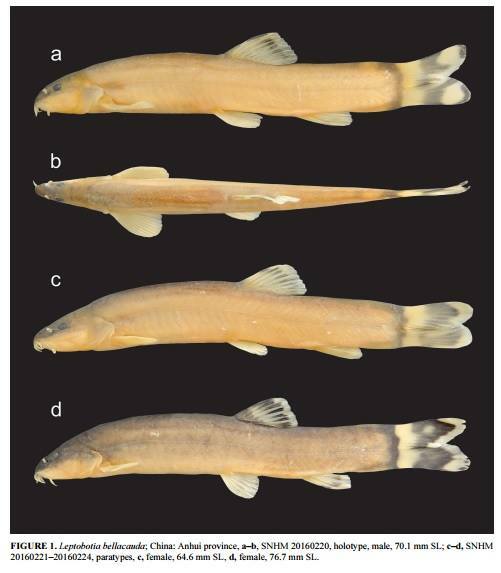 This new loach species description, Leptobotia bellacauda, a new species of loach from the lower Yangtze basin in China (Teleostei: Cypriniformes: Botiidae), was published in the journal Zootaxa December 5th, 2016. The paper, by Jörg Bohlen and Vendula Šlechtová, is available via subscription/paid access, and can be found here. Four new species of Tetragonopterus; Tetragonopterus franciscoensis Silva et al., 2016, Tetragonopterus juruena Silva et al., 2016, Tetragonopterus kuluene Silva et al., 2016, Tetragonopterus ommatus Silva et al., 2016. Photo credit: Silva et al. These four newly-described species of Tetragonopterus demonstrate a ghostly yellow hue in the afterlife, but likely were all quite attractive variations on a silver theme in real life. 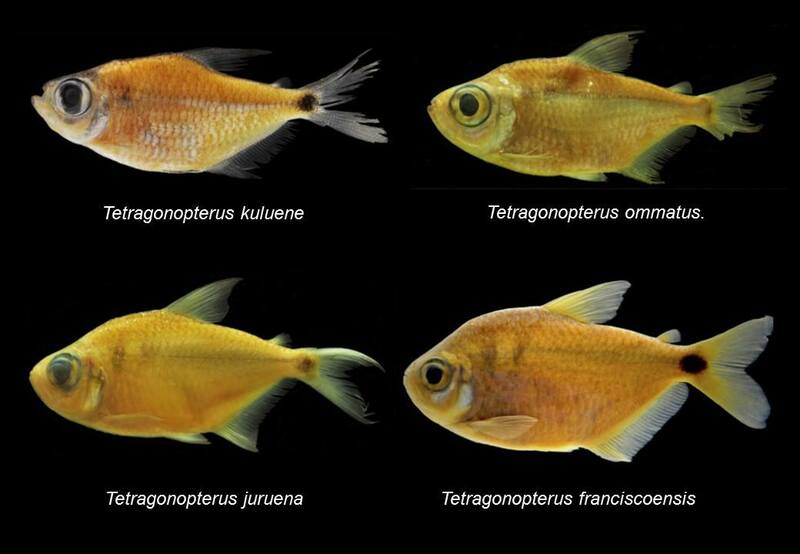 Looking at video of the related Tetragnopterus argenteus while alive, it’s even possible that these fish might have some actual attractive coloration. Sadly, all we get to see of these for the moment is the above photo, which is being circulated on the Internet. Authors Gabriel S. C. Silva, Bruno F. Melo, Claudio Oliveira, and Ricardo C. Benine, have published their Revision of the South American genus Tetragonopterus Cuvier, 1816 (Teleostei: Characidae) with description of four new species in the journal Zootaxa. The article, available through subscription/paid access, can be accessed here. a) Holotype of Oreonectes daqikongensis sp. n. NO.CNGZNU20110128002. b) A living Oreonectes daqikongensis sp. n. Photo Credit: Deng et al. We’ve saved the most de-pigmented of all the recent freshwater fish descriptions for last, and finally, we get to see a picture of the fish alive for a change! Unfortunately…it’s still rather bland. In the case of this last species in our review, we can give it a pass on its lackluster coloration, as this fish is a classic example of a subterranean fish in all its glory. Translucent white and no eyes when alive? Kinda cool…if you’re into that sort of thing. The cave-dwelling Oreonectes daqikongensis is a new species from the river loach family Balitoridae, so this ghostly white fish is more closely related to the Hillstream Loaches than, say, your more commonplace Clown Loach (Chromobotia macracanthus) or Yo Yo Loach (Botia almorhae) from the family Cobitidae. The paper, titled A new blind species of the cave genus Oreonectes from Guizhou, China (Nemacheilinae), by authors Huaiqing Deng, Huamei Wen, Ning Xiao, and Jiang Zhou, was published in the journal ZooKeys on November 28th, 2016. Readers are able to enjoy the full open-access article online. Bohlen, Jörg; Šlechtová, Vendula. 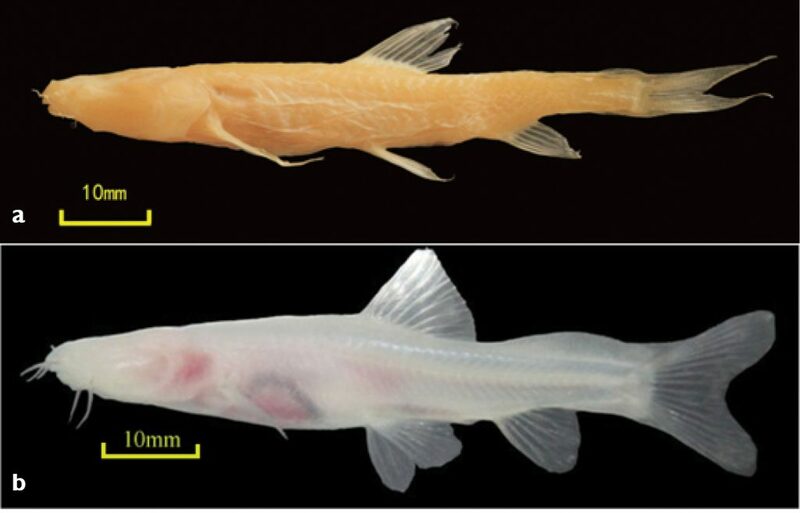 Leptobotia bellacauda, a new species of loach from the lower Yangtze basin in China (Teleostei: Cypriniformes: Botiidae). Zootaxa, [S.l. ], v. 4205, n. 1, p. 65–72, dec. 2016. ISSN 1175-5334. Siva, Gabriel S. C. et al. Revision of the South American genus Tetragonopterus Cuvier, 1816 (Teleostei: Characidae) with description of four new species. Zootaxa, [S.l. ], v. 4200, n. 1, p. 1–46, nov. 2016. ISSN 1175-5334. Deng H, Wen H, Xiao N, Zhou J (2016) A new blind species of the cave genus Oreonectes from Guizhou, China (Nemacheilinae). ZooKeys 637: 47-59.